Welcome back to Inside ATLAS.ti. After our summer break, we update you on some of the training activities and special programs of our worldwide network of ATLAS.ti teams. Centered in this issue: Latin America and the USA. 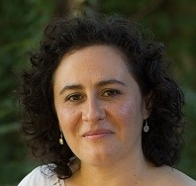 Moreover, we share with you a profile of Dr. Angela Frusciante from Knowledge Design to Change. Also, you will find in this issue of Inside ATLAS.ti the calendar of training for the next few months. Our esteemed colleague and partner Professor Dilmeire Sant'Anna Ramos Vosgerau, from the Pontificia Universidade Católica do Paraná (PUCPR), Curitiba, Brazil, taught her second ATLAS.ti workshop at the end of July. 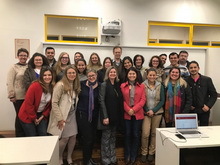 Twenty-one student from different graduate programs and universities in Brazil attended this valuable training opportunity. ATLAS.ti raffled a free ATLAS.ti license at the event, which was won by Raquel de Abreu Fochesato. 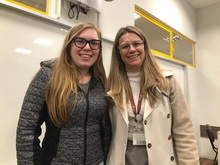 Raquel is a Master's student in the Postgraduate Education Program in Science and Mathematics at the Federal University of Paraná (UFPR). Her research is on teaching science in early childhood education. Congratulations to Raquel and best wishes in your research! In partnership with a number of organizations, including the International Institute for Qualitative Methodology, the Iberoamerican Network of Anthropologists, Investigación Cualitativa-Chile and New York State University Potsdam, we have created this year a new webinar series in qualitative methodology with presentations in Spanish and Portuguese. In September Drs. Eliana Gallardo-Echenique, from Perú, will talk about thematic analysis with ATLAS.ti, and Dr. Leonardo F. Nascimento from Brazil will present his research on web scrapping on a study of Uber Brazil. The full calendar for the year can be found here. The week of July 10th was a busy time for the United States/Canada regional office of ATLAS.ti. That week, we brought together a special group of instructors to teach a series of courses to graduate students, professors, and researchers from all around the United States, Canada and the Virgin Islands. They came to Corvallis motivated by a desire to meet other researchers, establish connections, and learn from renowned experts. The ATLAS.ti Classroom Award program supports professors who adopt ATLAS.ti in their university courses. The award is given three times a year with awardees receiving a free full license for professors and free six-month licenses for students. 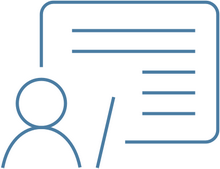 As part of the application process, professors need to submit a plan on how they will use ATLAS.ti in class and they must commit to submitting at the end of the semester a short report, including photographs, describing how the software was used and the results of the process. "Strategies are not the same as tactics. This core understanding of how things get done is at the root of the Five-Level QDA method. This is a method for working with ATLAS.ti that describes how expert users take best advantage of this powerful software. The purpose of the book is to unpack the unconscious processes that experts adopt so that they can be learned quickly and used by anyone." 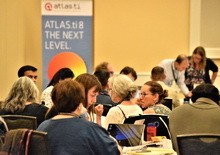 Nicholas H. Woolf and Christina Silver, authors of the book Qualitative Analysis Using ATLAS.ti: The Five-Level QDA® method published by Routledge, 2017. In this issue of Inside ATLAS.ti we interview Angela Frusciante from Knowledge Design to Change, a company based in Orange, Connecticut, United States. Angela uses ATLAS.ti in community research. Marta Morgada y Karmela Mendoza. ¡Bienvenido al desorden! Arte-factos para investigar con jóvenes talleres como dispositivos de investigación..
9:00 - 10:00 Ciudad de México.